HIIT. You’ve likely seen that acronym floating around a lot lately, as more people are trying High-Intensity Interval Training. We recently went into the basics of HIIT, but today we’re going to focus on what the real benefits are of this style of exercise. If you’re interested in giving it a try, but you’re not sure if it’s right for you, you’re in luck. At West Conshy Athletic Club, we offer a HIIT group exercise class that is perfect for giving you that new experience you’re looking for. Call us today to learn how you can claim your free pass today! If you’ve been looking for a way to speed up how quickly you can burn calories, HIIT might be the perfect fit. In fact, a recent study compared the amount of calories burned during HIIT, weight training, running, and biking. That study found that HIIT was able to burn up to 30 percent more calories than the other styles of exercise. The study had participants completing HIIT repetition that consisted of 20 seconds of maximum effort followed by 40 seconds of rest. The result is participants who are exercising for a third of the time as other workouts while achieving better results. That calorie burning power doesn’t stop as soon as you’re done exercising, though. HIIT helps to increase your overall metabolic rate for hours after your workout, further extending your calorie burning potential. In another study, it was found that two minutes of HIIT was able to increase the metabolism of participants over the next 24 hours as much as 30 minutes of running. That boost in metabolic rate also extends to our next benefit. As you likely know, two of the biggest pieces of the fat burning puzzle are metabolism and calorie burning. 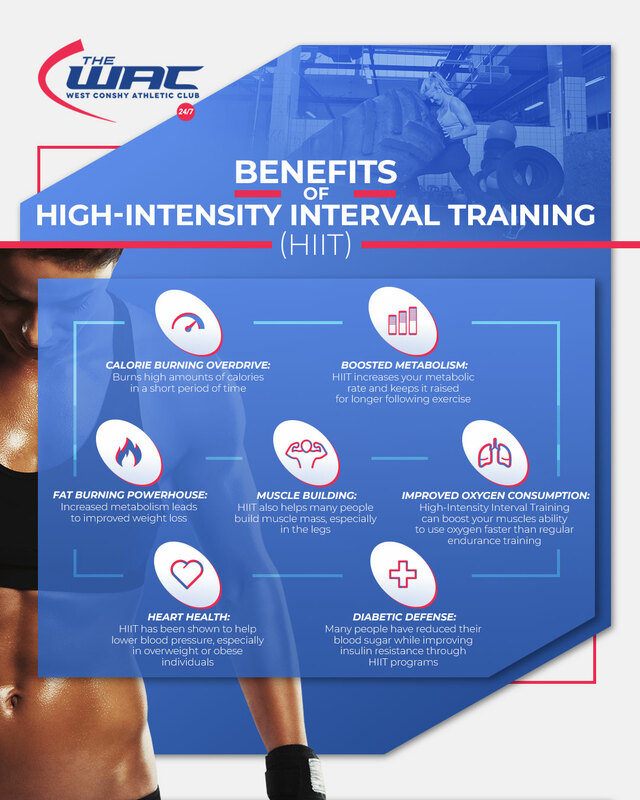 With the proven power of HIIT in both of those areas, it stands to reason that it would help many people burn fat and reduce their waists in less time than other forms of exercise. Individuals who have not been as active prior to beginning HIIT have also seen an increase in their muscle mass, especially focused in their legs and trunk. However, this increase hasn’t been seen as much in people who were already active, so it might not be the solution you’re looking for if you’re already lifting weights with an end goal of increased mass. Oxygen is that tricky thing that we need to survive, and oxygen consumption is the term describing how well our muscles use that oxygen. HIIT has been shown to improve that consumption more effectively than traditional endurance training. This ensures your body is receiving the oxygen, nutrients, and blood flow it needs to be healthy and effective. Another way that HIIT can help you is through its ability to lower heart rate and blood pressure in overweight or obese individuals. This helps to improve circulation while fending off heart disease. With that said, the impact on people who aren’t overweight shows little change in their blood pressure, if their levels are normal. With a HIIT program of fewer than 12 weeks, many people have seen a reduction in their blood sugar while improving their insulin resistance. This makes it a valuable regimen for people who are at risk of Type-2 Diabetes. If you’re looking for something a bit different than your bog standard workout, you might want to give HIIT a try. Call West Conshy Athletic Club in West Conshohocken today to learn how you can get started with our free pass.